I had no idea that opening for "H is for Hellgate" meant that the stage would literally be hotter than hell. But from the moment I loaded my drums into the Rendezvous Jewelbox theater, I practically melted. Fortunately I had enlisted my brother's help under my "roadie-for-a-night" program. (Thanks, Erik!) I also brought a fan to cool me down. The idea for the entertainment at STIFF was to have bands play onstage with a movie projecting behind them. Chris chose "Repo Man (Collector's Edition)," a cult film of the 80s starring Emelio Estevez and Harry Dean Stanton. We took the stage shortly after 11:00 p.m., introduced by two stand-up comedians, a first for me and Chris Mess. We played through our furious 35-minute set with "Repo Man" flickering behind us. Of course I couldn't watch the movie, but my brother said it worked really well--and some moments in the film matched musical moments. Between songs, Chris commented on the film and talked about the cool extras on the DVD. The band played well, and the vibe was friendly in the room. But for me personally, I never quite got into the zone; I've found it's a rare night when this happens for me--and rarer still for the entire band. You just hope your best effort sounds good, I guess. 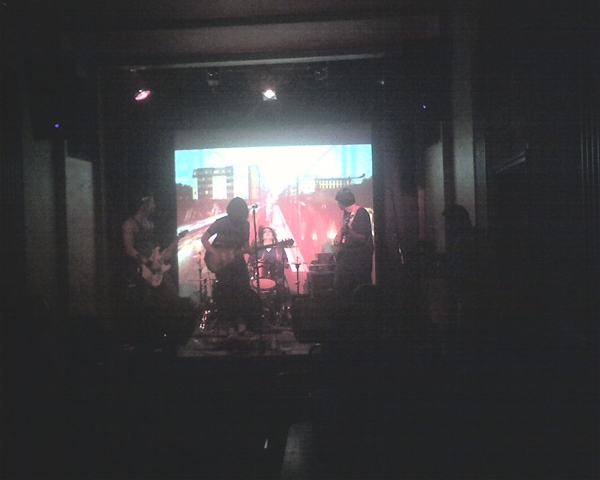 After our set, I watched "H is for Hellgate's" show. They have an indie style that includes progressive, rock, punk, and other elements. Plus, all the members of the band have some pretty funny dialog onstage. 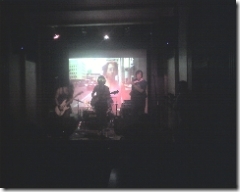 The movie "Run Lola Run" projected behind them, and I was surprised how interesting it was to watch a film and listen to live music. It's obvious from what I've read about "H is for Hellgate," that they're really starting to establish themselves around Seattle and elsewhere. Check them out or give them a listen if you get a chance.